Pages 38, 77, and 83 - Signature partially cut off. Pages 18 and 32 - Sentences end in a preposition. Page 74 and cover - Peter, James, and John likely were fishing with nets not poles. Page 83 - There is no documented record of Brigham Young presenting a key to the city to a flock of seagulls for saving Mormon crops from crickets; however, Salt Lake City Mayor Ted Wilson partially rectified this egregious oversight when he presented a key to the city to the syntha-pop band Flock of Seagulls in 1982. Page 30 - The frogs drawn in a picture representing Moses and the plague of frogs upon Egypt are clearly Adenomera araucaria, which--as everyone knows--are indigenous to South America. Page 9 - The Elders are teaching a single, elderly sister despite the fact that there are Sister missionaries in their zone that could be teaching her. Pages 3 through 91 - Human beings typically have five fingers on their hands not four. Ted Wilson did not present a key to the city to the band Flock of Seagulls. First let me congratulate you on the brutally honest way you have laid bare your journalistic errors to the world. Lesser organizations (such as NY Times and Oprah) should pay heed to your example and better vet their content. Secondly, I admire the respect you pay to grammar and usage as well as biological nomenclatura. Finally, I plan to hang on to all your first editions, for they with all their imperfections, much like the infamous "Inverted Jenny" stamp (http://en.wikipedia.org/wiki/Inverted_Jenny) are bound to increase in value with the passage of time. 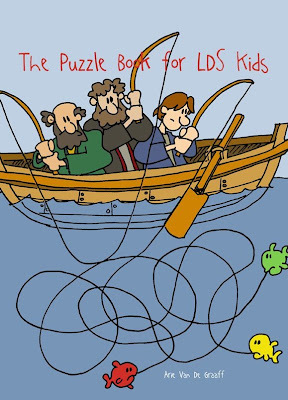 Despite the very minor mistakes, this is by far, the best LDS Activity Book for children on the market! Every child should have a copy - This book is the perfect way to pass extra time on Sunday afternoons. I love this post! It speaks to the editor in me. It's been too long since I last checked your blog and it's overwhelming trying to take in all the good humor in one dose.